A slugfest on July 4 seems oddly appropriate, and that’s essentially what we got as both starting pitchers were knocked out of the game early. When the dust settled, the Dodgers won the war of the bullpens to beat the Orioles, 7-5. The win extends the the Blue Crew’s winning streak to five games, and they’ve now won seven of eight. Julio Urias was knocked around early, lasting only 75 pitches and 3.1 innings in the start. He gave up five runs on six hits and two walks, which definitely counts as a disaster start. In his defense, in the three-run second inning he was getting the life squeezed out of him by a strike zone that was terrible all night long. That doesn’t change the fact that he didn’t necessarily have his best on a day when he was facing one of the best lineups in the majors, but it certainly didn’t help. Fortunately, the offense was right there to pick him up. In the second inning, Yasiel Puig and Yasmani Grandal hit back-to-back (the first time the Dodgers did this all year) dingers. In the fourth, the Dodgers continued to chip away and did their damage with two outs. After a Puig single, two strikeouts seemed to end any potential rally, but Scott Van Slyke drew a walk, and then back-to-back singles by Chase Utley and Corey Seager scored Puig and Van Slyke. All of sudden the Dodgers trailed by one. The offense then tied the game in the sixth when Grandal drew a walk, useless player Will Venable replaced him after narrowly avoiding a double play, and advanced to second on what seemed like an awful fortunate balk. After Kendrick struck out, Utley singled sharply to center to tie the game at 5-5 with Venable crossing the plate. The Dodgers then took the lead for good in the seventh, when Seager led off the frame with a triple and Justin Turner immediately cashed him in with a sacrifice fly to put the Dodgers in front 6-5. In the eighth, they added an insurance run behind a Chris Taylor walk and a Kendrick double down the right field line to give us the final score of 7-5. Of course, the reason that final score has just a five in it for the Orioles is the bullpen was absolutely stellar. Louis Coleman, Pedro Baez, Joe Blanton, Adam Liberatore, and Kenley Jansen combined to get 5.2 innings, allowing just two hits combined (both against Blanton) and striking out five batters in an absolutely dominating showing. It’s not usually a necessarily dominant or deep pen, but they’re second in the majors in ERA while being overworked by a starting staff that has struggled to go deep into games. Don’t want to hear about peripherals, just want the performance, right? There’s your performance so far. 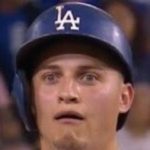 The Dodgers are now 48-37 overall and 27-15 at home. The Giants won today as well, so they still have a five-game lead in the NL West race, but the Dodgers lead the NL Wild Card home-field advantage race by 1.5 games and are 3.5 games clear of making the NL Wild Card game. They go for series win tomorrow against the Orioles at 4:10 PM HST/7:10 PM PST/10:10 PM EST with Kenta Maeda facing off against Chris Tillman.